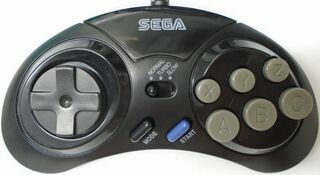 The 6 Button Arcade Pad with model number MK-1470 is a six button controller for the Sega Mega Drive released towards the end of the console's lifespan in North America. It is a successor to the Six Button Control Pad (model MK-1653), which is awkwardly also known as the "6 Button Arcade Pad" in North America. The MK-1470 primarily differs from the MK-1653 by adding a turbo switch and by being smaller in design. This particular control pad throws up many problems when attempting to document Mega Drive controllers. Not only was the "6 Button Arcade Pad" name used twice, but the model number was also used with a a different, cheaper control pad. The two MK-1470s are functionally identical but feature different aesthetics, build quality and performance. This MK-1470 was bundled with the Genesis 3 by Majesco, but was also sold separately.